What Types of Financial Apps Are Americans Using? Americans use their smartphones for an average of 3 hours and 35 minutes per day, research shows. So why not use some of that time to improve your financial situation? Luckily, there’s no shortage of financial apps for you to choose from. In fact, 63% of smartphone users have a financial app installed on their phone. 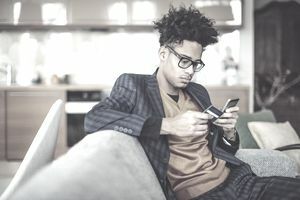 Read on to find out what types of financial apps people are using, their benefits, and our favorite apps, from those that help you budget to those that make it easy to send money to friends, even those that invest your spare change. Yes, really. A majority of smartphone users in the U.S., or around 55%, have one or more full-service banking app, a Bankrate survey found. And it makes sense since 43 percent of cell phone users with a bank account used mobile banking in the past year. Nearly half of Americans have a peer-to-peer payment app on their phone, while 17% have one or more budgeting apps. And investing apps aren’t to be left out, either. That same study found that 17% of smartphone users had one or more investing apps on their phones. So there’s no doubt that people are increasingly using their mobile devices to take care of their finances. But what are the benefits of having your finances so easily accessible? Perhaps the number one benefit of using a finance-based app on your phone is the ability to keep tabs on your money, from your bank balance to your investment portfolio, with ease. Say you’re out shopping or at brunch. You’d love to splurge on that pricey item or second drink, but you’re not sure it’s in line with your budget. Simply check your balance using your bank’s full-service banking app. Having a real-time picture of your available funds can help you keep tabs on your daily spending, stick to your budget, and also avoid costly overdraft fees. Online apps also make important financial tasks, like staying on top of your budget, starting an investment portfolio, or even checking your credit score much more accessible, especially for groups who may not be as likely to do these things. Another plus? Peer-to-peer payment apps like Venmo and Zelle make it easy to dine out with friends and pay only what you owe. Call us cheap, but who doesn’t hate splitting the check evenly, especially when you’re already on a budget? We rounded up our favorite apps below. From bank apps to budgeting tools to investing apps to peer-to-peer payment apps, there are many options to choose from. Do your research and find the app that works best for you and your financial goals—and feel free to download more than one. After all, if you don’t take control of your finances, who will? Virtual Wallet Virtual Wallet, the mobile banking app from PNC Bank, keeps an of-the-minute running total of your available funds. Its handy, color-coded design gives you a simple view of your account balances, online statements, and recent transactions. Chase Chase Bank’s mobile banking app does just what you’d expect from a full-service banking app. Gives you a running total of your balance, shows recent transactions and allows you to seamlessly toggle back and forth between accounts. Zelle A relatively new peer-to-peer payment app, Zelle prides itself on one major thing—the ability to send money to friends and family within minutes. Venmo This payment app has been around for a few years, and it's wildly popular with the millennial set (myself included). With Venmo, you can seamlessly send funds to others, and it also has a fun, newsfeed-like feature where you can see the transactions of your friends. Acorns Want to get started investing but not sure where to start? Acorns makes it easy. Just link your account to the app and with each purchase you make, it will invest your spare change. You can also set up recurring investments. Mint Mint is one of the most popular budgeting apps out there, and with good reason. You can do everything from creating a budget to pay bills to check your credit. YNAB Another popular budgeting app, You Need a Budget, affectionately dubbed YNAB by its users, operates on the idea that within your budget, you assign every dollar a purpose. How can you argue with that? Want to Be Financially Responsible? Do These 5 Things. What's the Average Cost of Adoption? Do You Know How to Calculate Your Net Worth? Does Your Insurance Cover the Cost of Braces? Are Le Tote and Stitch Fix Really Worth the Money?